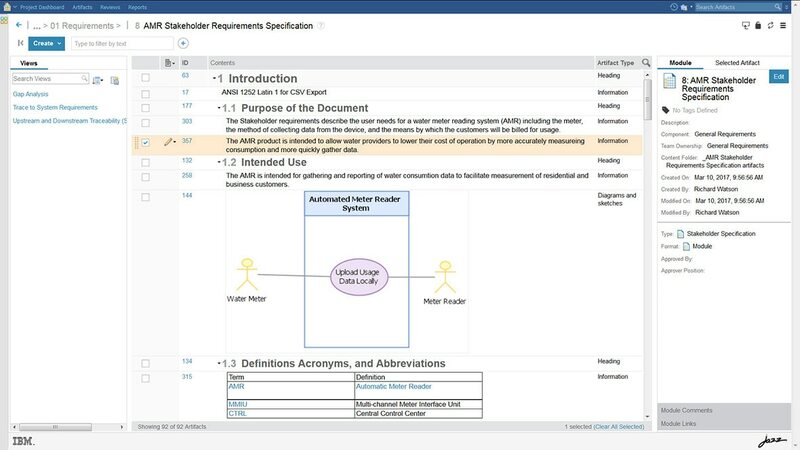 IBM Engineering Requirements Management DOORS Next provides a scalable solution to optimize communication, collaboration and verification of requirements. It enables you to capture, trace, analyze and manage changes to requirements while maintaining compliance to regulations and standards. With DOORS Next you can improve the management of project scope and cost throughout your organization and supply chain. This software is available on premises and in the cloud, which allows you to get up and running quickly so that your team can focus on your organization’s core competency. Understand customer needs and respond effectively to changes collaboratively as they occur. Capture and manage traceability to tests and other engineering artifacts, including software, throughout the product development lifecycle. Improve performance to help your teams reduce development costs by up to 57 percent, accelerate time to market by up to 20 percent and lower cost of quality by up to 69 percent. DOORS Next supports the optional Requirements Quality Assistant which evaluates and provides recommendations based on the INCOSE requirements standard reducing time to create quality requirements. Use the cloud to get up and running faster. With no hardware, provisioning or installation needed, your team can focus on your business goals and technological innovation instead of maintenance. Drive software and systems engineering with requirements in all forms of engineering domains including systems engineering, agile/lean/SAFe, continuous engineering and DevOps. Start experiencing the lower costs and efficiency gains of DOORS Next with this 45-day trial. Sign up today with with no commitment. IBM Engineering Requirements Management DOORS Next - Analyst in a single tenant cloud HTTPS secure site. IBM Engineering Requirements Management DOORS Next - Analyst in a single tenant virtual private cloud with IPsec VPN Tunnel. IBM Engineering Requirements Management DOORS Next - Analyst Authorized User Single Install license and software subscription and support for 12 months.